Saudi Arabia and Russia have agreed to freeze oil output in a meeting in Qatar. Ali al-Naimi, the Saudi Arabian oil minister met with Alexander Novakin Doha, his Russian counterpart, and representatives from Venezuela and Qatar in Doha on Tuesday where they agreed a freeze in the oil production at January levels. The agreement fell short of cutting production to shore up oil prices. 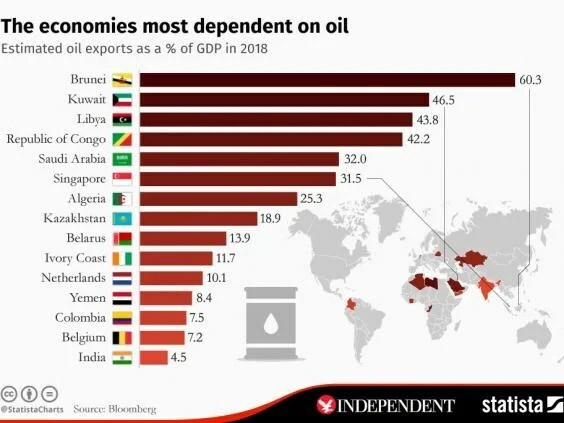 Saudi Arabia has one of the most oil reliant economies in the world, as shown by the above Statista infographic. King Salman said in a speech that the kingdom would seek to diversify its revenues in 2016. Venezuela has been hit hardest from low oil prices. It had lobbied exporters including Russia, Iran and Saudi Arabia to arrange a meeting with OPEC to try and reach an agreement. The deal is a huge turnaround from OPEC’s last meeting in December, when members were said to be hardly talking to one another. It now depends on the agreement of Iran and Iraq. The nations will meet for further talks on Wednesday, but analysts suspect Iran will be reluctant to freeze production because it has only just returned to the market following the lifting of sanctions. Previous Previous post: DEVELOPING NEWS: Richard Dawkins has suffered a stroke. Next Next post: Nike Drops Manny Pacquiao Following Anti-Gay Comments.